Fertile House is located in a residential neighborhood in Tours, a mid-sized town located in the Loire valley. 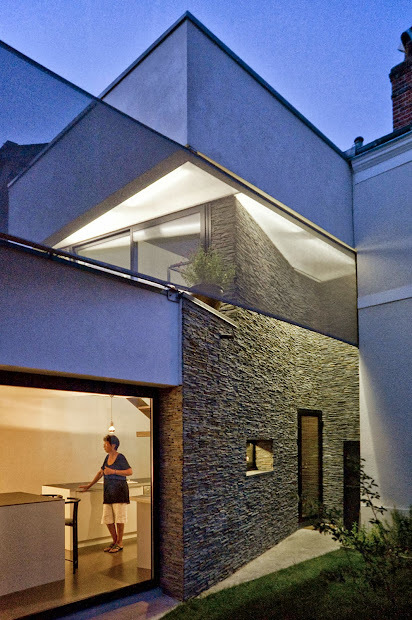 The project is, at once, a renovation of an existing house and an extension even larger than the original building. 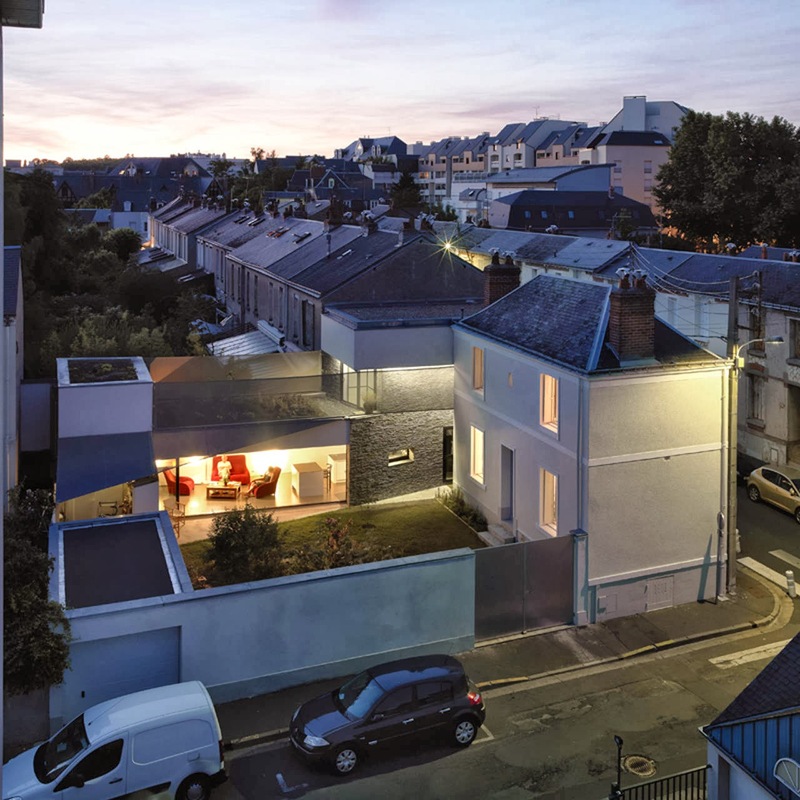 The aging owners asked to have their living spaces at the street-level, desired a greener haven to contrast their ever-developing town, and also wanted the ability to accommodate their children and grandchildren for frequent visits. Situated at the corner of the street, the existing house stands apart from the other traditional houses of the neighborhood. The entry and few windows of the traditional home face the interior of the block, while all other houses in the neighborhood, more conventionally, have windows facing the street. The original street-side façade was actually completely bare. 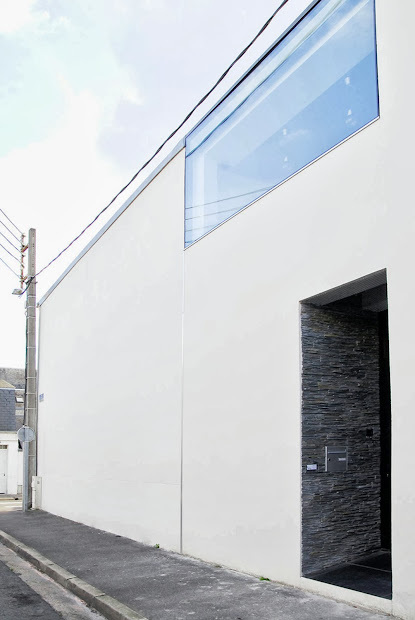 Even now, it remains minimal, though the new building possesses a street-side recessed entry and an upper-story opening which lets in morning light. 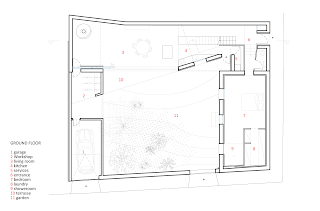 MU designed the addition to hide the new living areas from outside view and thus ensure the privacy of a house which originally stood alone on a farm but now stands on a denser city block. 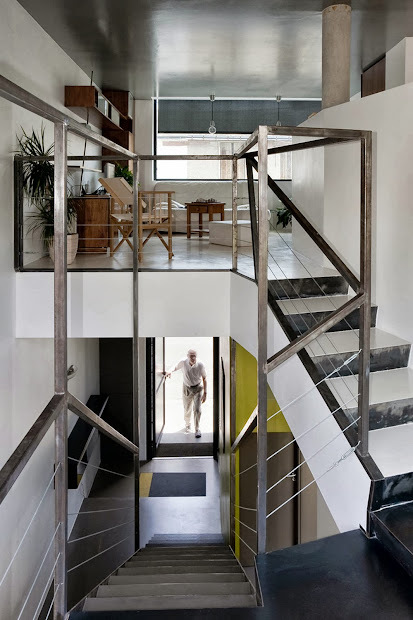 Designed for an aging couple, the project was meant to restructure the living areas so that, if needed, it would be possible to live on the ground floor only. 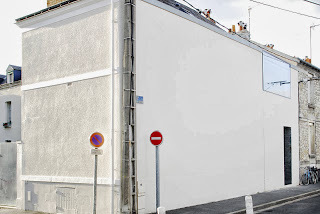 The building now has a ‘U’ shape with the renovated garage on one extremity and the original house on the other. 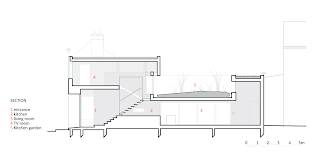 The extension, exposed south, links the existing buildings, and now hosts the living areas. The sleeping areas have all been grouped in the old house. The owners’ bedroom and bathroom are situated on the ground floor, adjacent to the kitchen and the living room, and the upper floor is dedicated to guests. 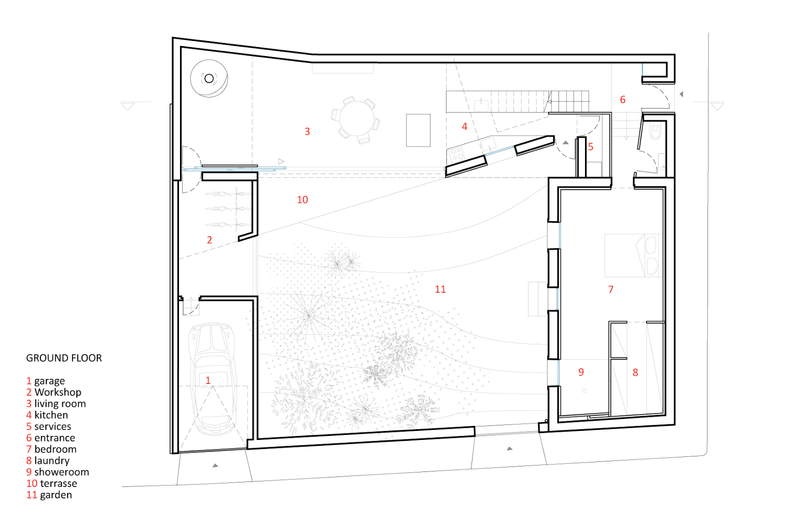 On the upper floor are a TV room and two guest bedrooms separated by a bathroom. Finally, the original attic has been halfway opened to the floor just below it, providing an extra bedroom. 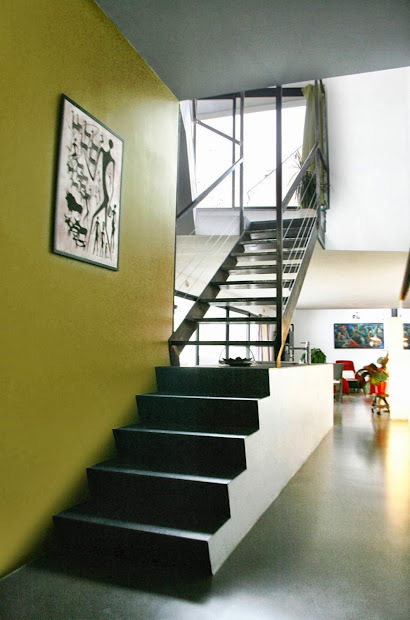 The new mezzanine is protected by a net, and its playful colors are an invitation to the youngest members of the family. The project embraces non-traditional entry spaces, windows, and materials, while it simultaneously strives to preserve some of the simplicity of the traditional house. 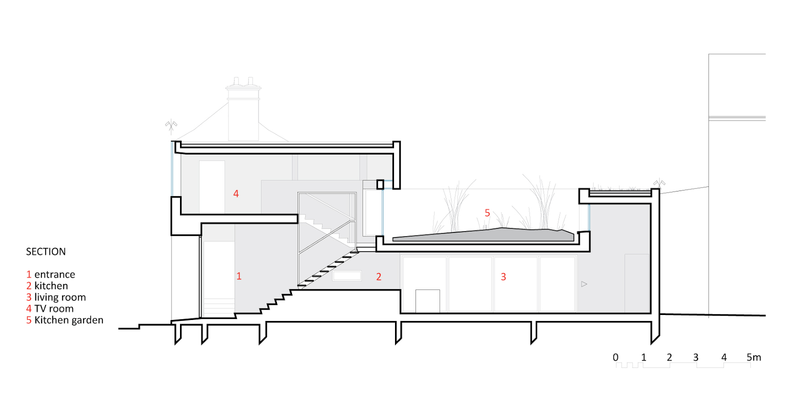 The project’s key focus is the interaction between the inside and the outside. 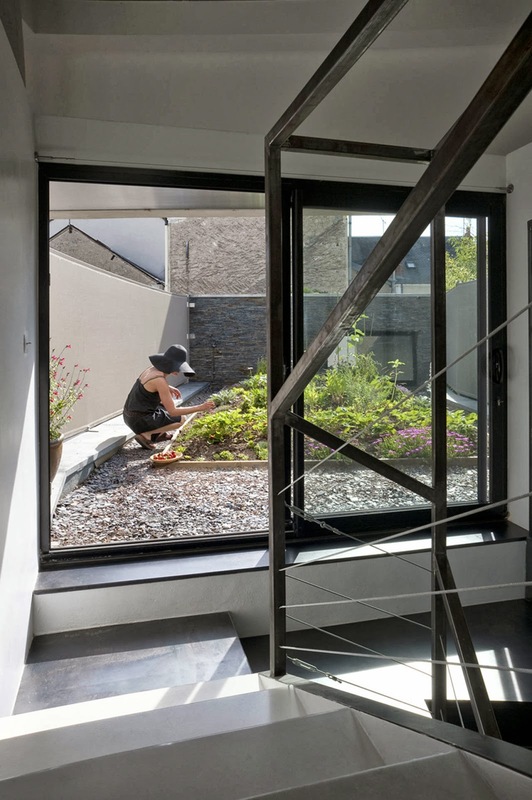 On the upper floor, a window accesses a view to a rooftop vegetable garden. 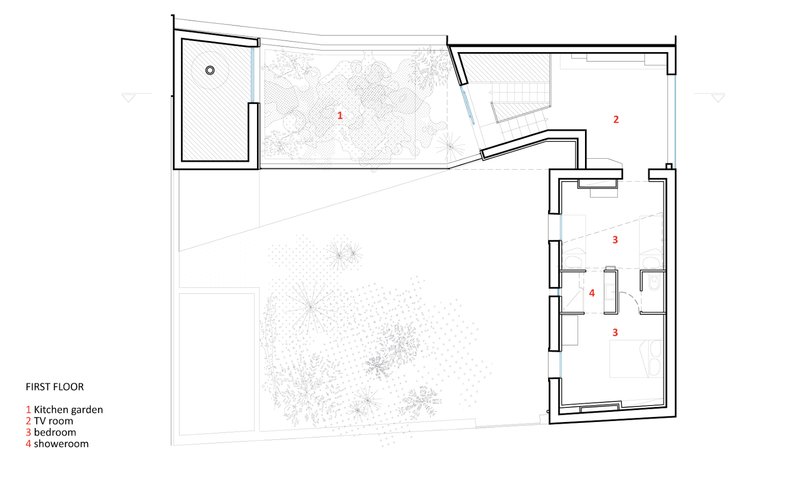 Similarly, on the ground floor, when the large glass wall is retracted, the courtyard garden becomes part of the living room. 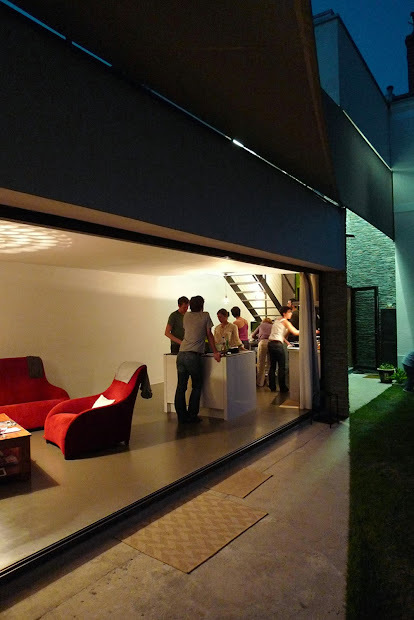 A resin floor in the indoor living room becomes a concrete slab forming a patio outside. 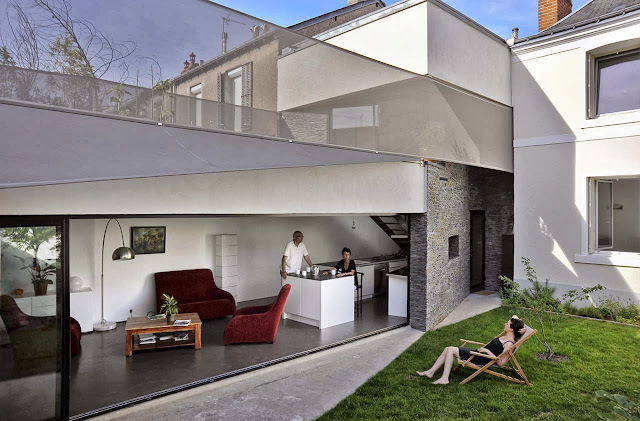 On the exterior, polycarbonate linings around hidden light fixtures enable artificial light to reflect onto the garden at night, and also bleed into the interior spaces. The lines of the building are meant also to maximize continuity between the indoor and outdoor living areas and between spaces in the existing house and the addition. 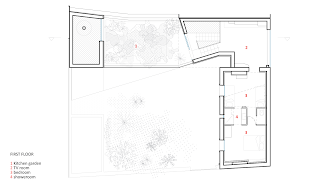 The slab of the patio follows the line of the shade above, which itself emerged from studying the interaction of daylight with the indoor living area. The two floors of the house are linked by an unrefined steel staircase—part of which parallels the external shade, while the other flight aligns the perpendicular axes of the original house. The staircase rests upon the countertop of the open kitchen, inviting guests to anchor in the convivial gathering place or to escape back into the lofty guest spaces. 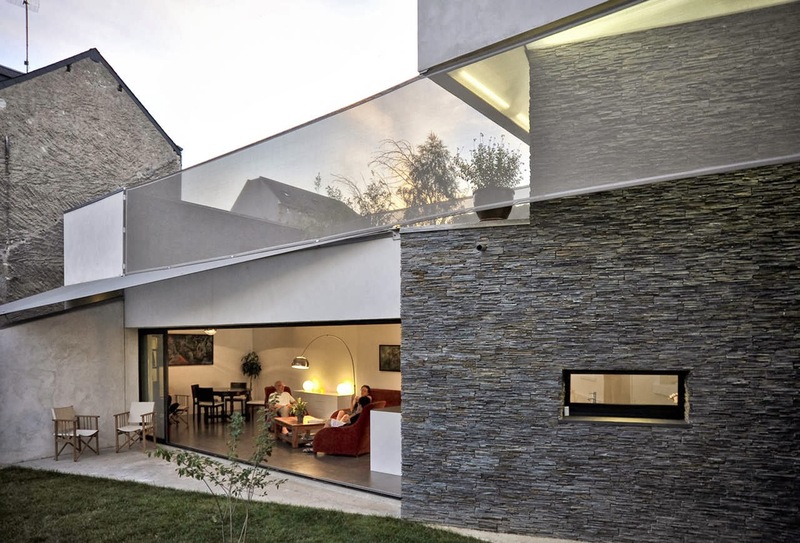 The schist-covered portion of the patio façade on the ground floor angles slightly to create a sheltered entrance to the kitchen, right at the junction of old and new construction. Minimizing environmental impact was another key dimension of the project. Extensive passive ventilation enables the house to keep cool during hot summer days. The roof is a vegetable garden, which cools the house passively during hot weather. 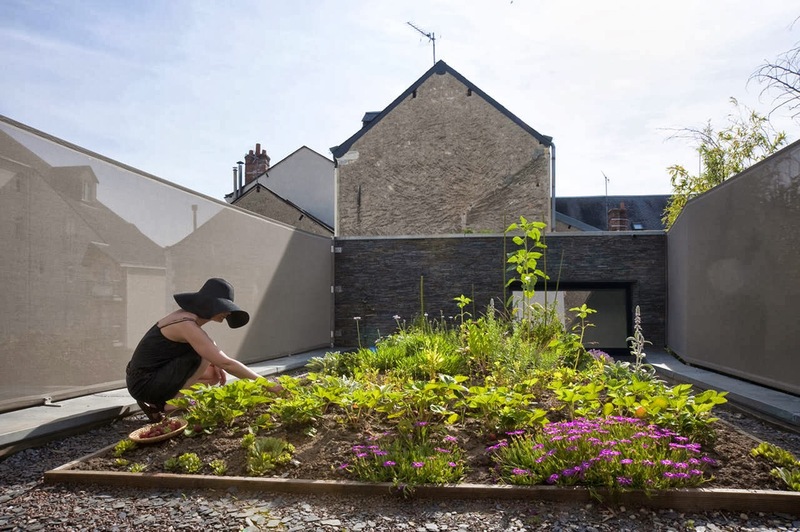 The garden was conceived as a real open-air room where the owners can enjoy their passion for gardening. The earth used for green space comes from the very ground where the extension was built—a throwback to the market garden present at the site only a century ago. The silt content of the soil makes it particularly suitable for vegetable gardening. Also incorporated into the environmental design are earth cooling tubes and solar panels. Fertile house is a renovation and addition which restores a sense of bucolic privacy while imagining the future of indoor/outdoor living in an urban setting.